H&I | Do you remember the Star Wars Holiday Special? Do you remember the Star Wars Holiday Special? Celebration, family, togetherness… Wookies? If a big walking carpet doesn't get you in the holiday spirit, what will? That was sort of the idea behind CBS's ill-fated 1978 Star Wars Holiday Special. The network brought the idea of a holiday variety special to Star Wars director George Lucas, hoping that a year out from the massive success of the first film, fans would be eager for more from their beloved characters: Luke, Leia, Han, R2-D2, C-3PO and Chewbacca. It was a big opportunity to bring a blockbuster film to the more accessible world of home television, and a way to whet the appetite of audiences before the release of sequel The Empire Strikes Back in 1980. Lucas was reportedly not stoked about the idea, but offered up some inspiration and allowed the production to go forward. The rest, as they say, is history. The Star Wars Holiday Special, which reunited most of the main cast — including Mark Hamill, Harrison Ford, Carrie Fisher, Peter Mayhew and Anthony Daniels — was so poorly received by fans and critics, it remains a punchline today. It ranks No. 1 in the book What Were They Thinking? : The 100 Dumbest Events in Television History by David Hofstede, and is practically disowned by Lucas and the cast. Still, we sort of have a soft spot for the special, which is so unrelentlessly cheesy in a way that can only be earnest. Here are some more facts about the Star Wars Holiday Special you might not remember. The special introduced us to Boba Fett. 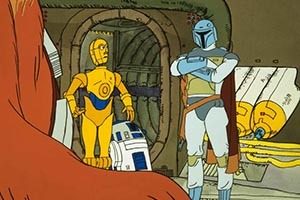 Yes, believe it or not, the one lasting thing the Star Wars Holiday Special gave the world was the character Boba Fett. The Mandalorian bounty hunter technically made his first appearance in a county fair parade, but the special was his screen debut — and it was animated. The live-action character shows up in Empire and has become one of the most beloved in Star Wars canon. George Lucas created Life Day. The special has several smaller storylines, but the main one focuses on Han Solo and Chewbacca visiting Chewbacca's home planet Kashyyyk to celebrate Life Day, which is essentially a Wookie mash-up of Thanksgiving and Christmas. 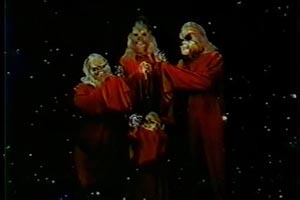 George Lucas had almost nothing to do with the special, and does not receive a credit, but it was his idea to build the narrative around Chewbacca's family and the Life Day holiday. Bea Arthur, Art Carney and Jefferson Starship made cameos. We're not sure how CBS convinced stars like Bea Arthur and Art Carney to show up (we assume the popularity of the Star Wars brand helped), but show up they did for notable appearances. 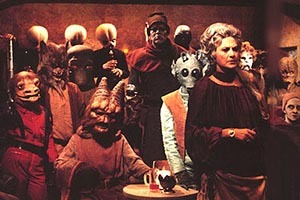 Arthur plays Ackmena and runs the Mos Eisley Cantina, Carney plays a Kashyyyk trader named Saun Danns, Harvey Korman plays three characters (including a four-armed alien woman who's also a chef), while Jefferson Starship and Diahann Carroll performed some pretty trippy musical numbers. Princess Leia gets a musical number. It probably made sense to the writers to give actress Carrie Fisher a triumphant musical performance to close out the show. Fisher is, after all, the daughter of crooner Eddie Fisher and Singin' in the Rain actress Debbie Reynolds. No offense to Carrie, who really gives it her all, but the weird transformation of the main Star Wars theme into a touching holiday sing-along proved a bit difficult to pull off. The cast still makes fun of it. In a 2006 appearance on Late Night With Conan O'Brien, Harrison Ford jokingly told the host that he had no memory of making the Star Wars Holiday Special and that it therefore "doesn't exist." Carrie Fisher has said in several appearances that she likes to show the special at parties, "mainly at the end of the night when I want people to leave." Mark Hamill said in a Reddit AMA that he "thought it was a mistake from the beginning" and that it was "unlike anything else in the Star Wars universe." But he keeps a good spirit about it, adding they should make an extra on the DVDs to "show how incredibly fallible we are!"